After a lot of nerves and rehearsed scenarios you have finally asked the person that you are attracted to out on a date, and unsure of where to go and what to do on that date you have decided to go to the movies. This is a venue that has been popular with couples for decades, somewhere where they could hold hands in the dark and share a tub of popcorn while enjoying the film. Whether you think it a good choice of venue or not it does have distinct advantages and disadvantages as a location for that all important first date. Deciding to take in a film at the movies does take a lot of pressure off whoever has been charged with organising the date. After all, you know exactly where you will be going, what time the film begin and when it will be ending, so all of those decisions have been made for you. This takes away any indecisiveness about the setting or timing of the date, it also makes you appear organised in their eyes. Sitting close together inside a move theatre gives you the perfect chance to observe the other person’s body language. By watching how they react to events and stimuli in the movie you can gain an understanding of their likes and dislikes, as well as emotional reactions to things. It can also give you some insight as to their sense of humour, and whether you find the same things funny. A comedy film may make a good first choice as if you can laugh together you stand more chance of having a longer relationship. One of the aspects of a date in the cinema that has thrilled couples for many a year, is the off chance that there will be a moment of unexpected physical contact. It could be that you are sharing a tub of popcorn and you both reach for the tub at the same time, which will result in a look and a flirty smile. This is flirting at its very basic level. It may be that this is the first time that you have had the opportunity to make contact with one another and may lead to the two of you holding hands, plus the cover of the darkened cinema makes it very discreet. On the down side once in your seats inside the cinema there is little change of having that all important conversation where you spend time getting to know each other, you will both be sat in silence for around an hour and a half for the duration of the film. More attention is paid to the events happening on the big screen than to the person sitting next to them. Any words that are spoken at all will be whispered and will be of nothing more important than a request to pass the popcorn. 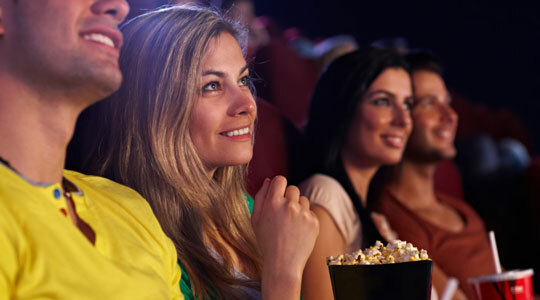 Another downside of the movies as a date venue is the lack of privacy that it offers, you may be spending much wanted time together but you are doing it in a public space surrounded by strangers. Even if you dared to whisper to each other you would probably be over heard by the people sitting either behind or in front of you, and there is less likely to be a stolen kiss when all of your actions are clearly on view to the people around you. The cinema is not a venue that is conducive to communication, there is no opportunity to dedicate time to getting to know each other as there would be over a romantic meal or picnic in the park, and considering that a first date is usually used to decide whether you get along well enough to have a second date, the lack of communication and interaction could pose a problem. Sitting at close quarters with someone you are attracted to but to whom you cannot speak or interact with is frustrating, and may result in any concentration required to watch the movie being lost, or you could be so wound up worrying about what is going to happen when the film ends that you wind up paying little attention to the film at all, counting down the time until you are back outside. As with many first date situations and locations the cinema has its pros and cons. Whilst any verbal contact in the cinema might be limited to a few whispered exchanges, there is always the time you get to spend together after the movies. You could go for a drink or maybe a coffee which will provide you with plenty of opportunity to fill in the gaps and maybe arrange the following date in a more romantic venue.